Knee Injuries After a Car Accident | The Green Law Firm, P.C. The National Highway Traffic Safety Administration (NHTSA) reports that 2.4 million people were injured in car accidents in the United States in 2015, an increase from 2.3 million in 2014. Even relatively minor accidents may cause injuries that can significantly affect someone for months or even years after their accident. While these injuries may not be life threatening, they can quite easily reduce your quality of life, create an inability to work or maintain employment, and potentially cause a lifetime of pain and suffering. The force of a collision can bend the knees at an awkward angle, causing ligament or tendon damage. The knee can make sudden contact with the dashboard, the steering wheel, or loose objects within the car, causing bone fractures or soft tissue injury. Treatment for knee injuries after a car accident will depend on the type of injury and the severity. Minor injuries may heal without incident with minimal treatment. A common, conservative treatment typically prescribed for minor knee injuries is the RICE method of treatment, involving R – Rest, I – Ice, C – Compression, and E – Elevation. Minor injuries may heal and disappear within a few days to a week with this treatment. Should this conservative treatment method fail however, or in the event of a much more serious injury sustained in the accident, your doctor may recommend treatments including physical therapy, or even surgical repair. Meniscus tears – meniscus tears can often be treated with rest and rehabilitation, but more severe tears require surgery to correct. Proper diagnosis and treatment of knee injuries after a car accident is crucial to getting you back up on your feet again as quickly as possible, without complications or long-term effects. A CT scan or an MRI may be required to diagnose the scope of the injury. If you’ve been injured in a car accident in Colorado Springs, an experienced personal injury lawyer will work with you throughout your case to help you recover lost wages and medical expenses. 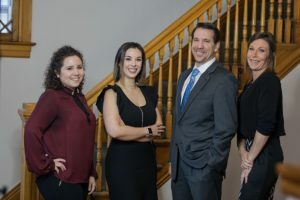 Contact the experienced Colorado Springs car accident attorneys at the Green Law Firm today to schedule a no-obligation consultation and discuss your case. Call us today at 1-719-694-8515.